The use of watermarks is almost as old as paper manufacturing. Ancients poured their "half-stuff" slurry of fiber and water onto mesh molds to collect the fiber, then dispersed the slurry within "deckle" frames to add shape and uniformity, and finally applied great pressure to expel the water and cohere the fiber. This process hasn't changed too terribly much in 2,000 years, even with the benefit of automation. One byproduct of this process is the watermark - the technique of impressing into the paper a form, image or text derived from the "negative" in the mold, as the paper fibers are squeezed and dried. Paper watermarks have been in wide use since the late middle ages. Their earliest use seems to have been to record the manufacturer's trademark on the product so that the authenticity could be clearly established without degrading the aesthetics and utility of the stock. In more recent times, watermarks have also been used to certify the composition of the paper, including the nature of the fibers used. Today, most developed countries also watermark their paper currencies and postage stamps to make forgery more difficult. The digitization of our world expanded our concept of watermark to include immaterial, digital impressions for use in authenticating ownership claims and protecting proprietary interests. However, in principle, digital watermarks are not unlike their paper ancestors. They signify something about the token of a document or file in which they inhere . Whether the product of a Fourdrinier paper press or a discrete cosine transformation , watermarks of varying degrees of visibility are added to presentation media as a guarantee of authenticity, quality, ownership, and source. A digital watermark is a digital signal or pattern inserted into a digital "document" (e.g., text, graphics, multimedia presentations). As such, it is a form of electronic watermark much like the corporate logos used by the cable television industry to identify the source of the program on screen, typically along the lower periphery of the television screen. Such cable companies, we may assume, feel that the advertising advantage of the ever-present, on-screen logo, together with the legal benefit of having a source signature persist under video recording, more than offset the aggregate user-annoyance and distraction. 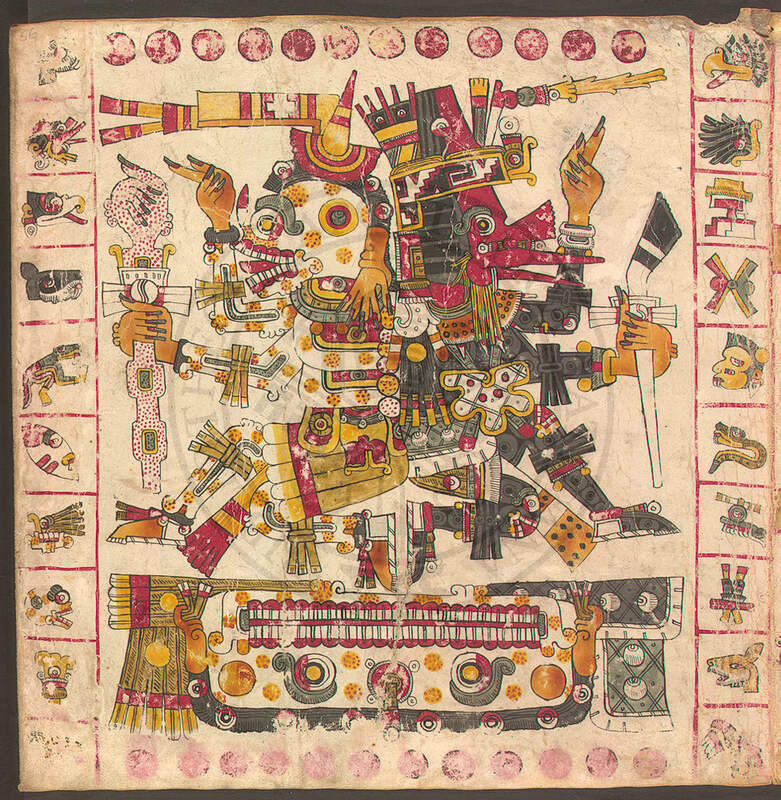 Figure 1.Digitized copy of artwork from a sixteenth century Aztec manuscript. Note that thecircular digital watermark is most visible against light background. Faint watermarks tend to "hide" in the intense, foreground imagery. [Source: IBM's Digital Library Project. Used with permission.]. Before we get into the detail of what digital watermarking is, we'll first explain what it is not. Digital watermarking is not encryption, which also involves file transformation. It is a common practice nowadays to encrypt digital documents so that they become un-viewable without a decryption key. Unlike encryption, however, digital watermarking leaves the original image or (or file) basically intact and recognizable. Further, decrypted documents are free of any residual effects of encryption, whereas visible digital watermarks are designed to be persistent in viewing, printing, or subsequent re-transmission or dissemination. Digital watermarking is also to be contrasted with digital fingerprinting, which produces a "meta" file that describes the contents of the source file. Cyclic redundancy checking and checksum algorithms are both simple uses of file fingerprinting for error detection applications. A more advanced use of fingerprinting is to be found in RSA Data Security's use of message digests for authentication purposes. Digests are the result of applying a hashing algorithm (e.g., MD5, SHA) to a document or file to produce an identifying bit string (fingerprint). If the receiver's hash algorithm produces the same message digest for the file as the sender's, the file is authentic. Of course, this assumes that sender and receiver use the same software, hence the same hash algorithm. Fingerprints may also serve as a digital signatures. If the message digest discussed above were further encrypted, converted to plaintext, and attached to the original file or message in transit, the plaintext version of the message digest (fingerprint) would also serve as a digital signature for the original file. While both fingerprints and signatures accompany unaltered source documents, signatures, like their penned counterparts, are embedded in the document itself even if in encrypted form. Authentication is but one use of digital watermarking. Both symmetric and asymmetric hashing algorithms can be used to embed a unique digital imprint on a document or file. If the removal of an imprint yields the original document (which is to say that the "stripped" watermark is identical to the embedded watermark), then the copy is authentic. Once again, this assumes that the "stripping" algorithm is available to the end-user. 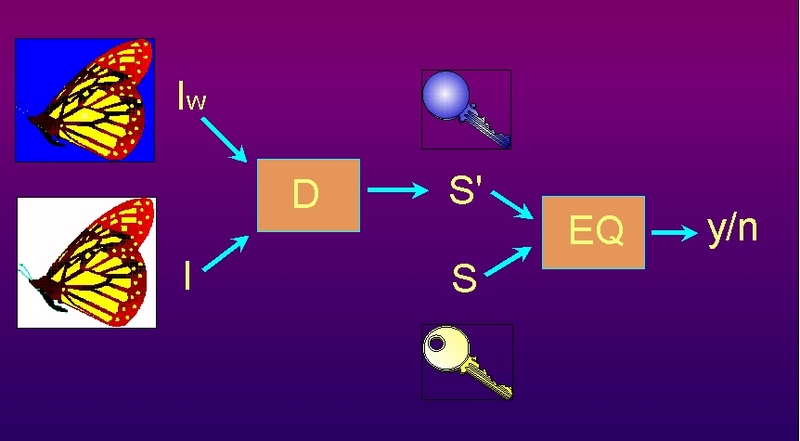 Such authentication techniques are usually associated with some sort of encryption for the distribution of keys, programs, etc. which are related to the watermarked documents. In addition, watermarks are also used as a check for non-repudiable duplication and transmission. In this case, the owner, creator or sender imprints a watermark which is unique for each receiver. The watermark holds under subsequent re-transmission, so the "authorized" source of unauthorized copies may be easily identified after extraction. A collateral benefit is that the intended recipient of a document token could always be identified. However, these applications really only apply to the class of invisible watermarks. 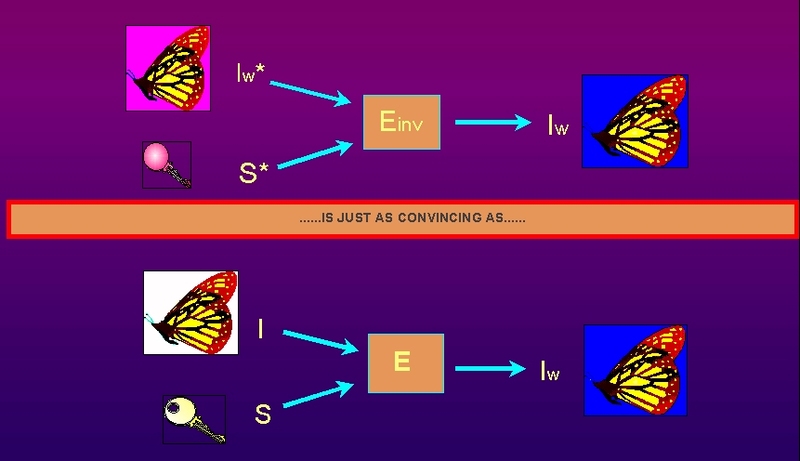 Visible watermarks (as in Figure 1) contribute to document and transmission security in different ways. To illustrate, visible watermarks are more overt means of discouraging theft and unauthorized use both by reducing the commercial value of a document and making it obvious to the criminally inclined that the document's ownership has been definitively established . We observe that invisible watermarks only have this effect if the digital thief is aware of the technology and the possibility that watermarks may be present on a document of interest. There are several characteristics of effective watermarks. For one, they must be difficult or impossible to remove. For another, they must survive common document modifications and transformations (e.g., cropping and compressing image files). Third, they must, in principle at least, be easily detectable and removable by authorized users with such privileges (e.g., law enforcement agencies). Invisible watermarks should also be imperceptible, while visible watermarks should be perceptible enough to discourage theft but not perceptible enough to decrease the utility or appreciation of the document. Watermarking techniques tend to divide into two categories, text and image, according to the type of document to be watermarked. In the case of imagery, several different methods enable watermarking in the spatial domain from simply flipping low-order bits of selected pixels to superimposing watermark symbols over an area of a graphic. Spatial domain watermarking is illustrated in Figures 2a and 2b that demonstrate how the degree of visibility of the watermark depends upon its intensity and the nature of the background. Figures Figures 2a and 2b.Two (of many) Two watermarked images identical but for the intensity of the image. Considerable latitude is available, in terms of placement, size and intensity to blend the watermark into a graphic. Another spatial watermarking technique uses color separation. In this way, the watermark appears in only one of the color bands. This renders the watermark visibly subtle such that it is difficult to detect under regular viewing. However, the watermark appears immediately when the colors are separated for printing. This renders the document useless to the printer unless the watermark can be removed from the color band. This approach is used commercially for journalists to inspect digital pictures from a photo-stockhouse before buying un-watermarked versions. An alternative to spatial watermarking is frequency domain. In this case, transforms like the Fast Fourier Transform (FFT) alter the pixel-values of the image for chosen frequencies. Since high frequencies will be lost by compression or scaling, the watermark signal is applied to lower frequencies, or better yet, applied adaptively to frequencies that contain important information of the original picture (feature-based schemes). Since watermarks applied to the frequency domain will be dispersed over the entirety of the spatial image upon inverse transformation, this method is not as susceptible to defeat by cropping as the spatial technique. However, there is more of a tradeoff here between invisibility and decodability, since the watermark is in effect applied indiscriminately across the spatial image. Watermarking can be applied to text images as well. Three proposed methods are: text line coding, word space coding, and character encoding. 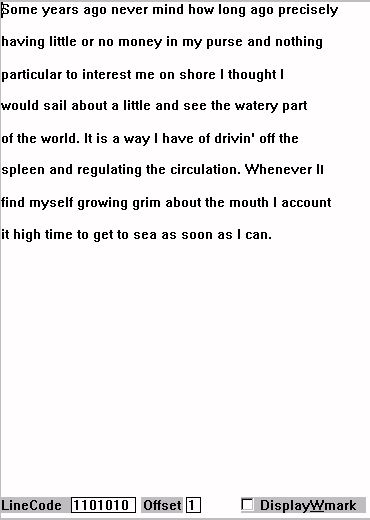 For text line coding, the text lines of a document page are shifted imperceptibly up or down. 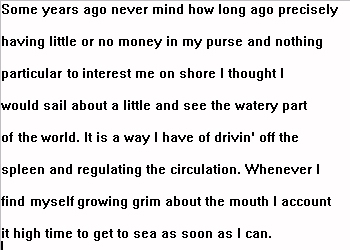 For a 40-line text page, for instance, this yields 240 possible codewords. Figure 3a illustrates text line coding as it would appear to the casual reader. According to the line code box, the first, second, fourth and sixth lines are elevated by 1 pixel, although the alteration is practically imperceptible. The effectiveness of such watermarking is confirmed in Figure 3b. Even with the affected lines set apart in red, it is still difficult to determine that the lines are elevated. Figure 3a.Text with lines 1,2,4 and 6 elevated from normal position by 1 pixel. For word-shift coding, the spacing between words in a line of justified text is altered. The plaintext in Figure 4a has three words shifted right one pixel. Figure 4b highlights the affected words. Figure 4a.Text with three words offset by one pixel. Figure 4b.Text with offset words highlighted. The remaining text watermarking technique involves character coding. This involves minor alterations to the shapes of characters - e.g., clipping a serif imperceptibly, or extending a descender. An advantage of these methods over those applied to picture images is that, by combining two or three of these to one document, two documents with different watermarks cannot be spatially registered to extract the watermark. Of course, the watermark can be defeated by retyping the text. As of this writing, a counterfeiting scheme has been demonstrated for a class of invertible, feature-based, frequency domain, invisible watermarking algorithms. This counterfeiting scheme could be used to subvert ownership claims because the recovery of the digital signature from a watermarked image requires a comparison with an original. We may illustrate the point simply with graphics. Standard watermarking involves the creation of a watermarked image by encoding a signature into an original image. Authentication proceeds in two stages. First, the watermarks signature is "removed" from the watermarked copy. 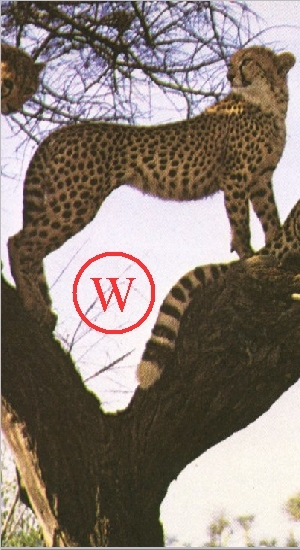 The watermark signature is the "difference" between the original (white) and the watermarked copy of the original (blue). Next, the extracted signature (blue) is compared against the original signature (gold). Identity signifies authenticity of the copy. Figure 5b.Watermark "inversion" for counterfeiting. The counterfeiting scheme (see Figure 5b) works by first creating a counterfeit watermarked copy (violet) from the genuine watermarked copy (blue) by effectively inverting the genuine watermark. This inversion produces a counterfeit signature (violet) as well. The trick is that the original image and bonafide signature stand in the same relationship to the watermarked image as the counterfeit image and counterfeit signature (see Figure 5c). Thus, the technique of establishing legitimate ownership by recovering the signature watermark by comparing a watermarked image with the original image breaks down. While it may be demonstrated that at least one recipient has a counterfeit watermarked copy, it can not be determined who it is. This research suggests that not all watermarking techniques will be useful in resolving ownership disputes in courts of law. There will likely be non-commercial applications, or those with limited vulnerability to theft, where "good enough watermarking" will suffice. More sensitive applications may require non-invertable or non-extracting watermarking techniques. These issues are under consideration at this writing. The enormous popularity of the World Wide Web in the early 1990's demonstrated the commercial potential of offering multimedia resources through the digital networks. Since commercial interests seek to use the digital networks to offer digital media for profit, they have a strong interest in protecting their ownership rights. Digital watermarking has been proposed as one way to protect such interests. Though much research remains before watermarking systems become robust and widely available, there is much promise that they will contribute significantly to the protection of proprietary interests of electronic media. Collateral technology will also be necessary to automate the process of authentication, non-repudiable transmission and validation. Some of this material was adapted from Berghel, H. and L. O'Gorman, "Protecting Ownership Rights through Digital Watermarking," IEEE Computer, 29:7, pp. 101-103 (1996). A good overview of how counterfeiters could "attack" watermarked images based on the correlation of the differences between samples is reported in Stone, H., "Analysis of Attacks on Image Watermarks with Randomized Coefficients," NEC Research Institute Technical Report, May 17, 1996. The counterfeiting scheme described here will appear in Craver, S., N. Memon, B. Yeo, and M. Yeung, "Resolving Rightful Ownerships with Invisible Watermarking Techniques: Limitations, Attacks and Implications," IEEE Journal on Selected Areas of Communications, December, 1997. The latter two papers also contain useful references to the watermarking literature. Information on IBM's digital library project (e.g., Figure 1) is to be found at http://www.ibm.com/IBM/ibmgives/diglib.htm. The images in Figures 2a through 3b were taken from our digital watermarking demonstration program which is available as freeware for non-commercial use through the author's ftp site (see homepage URL, below).